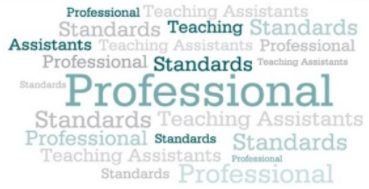 The Professional Standards for Teaching Assistants were originally drafted by a working group set up by the Department for Education (DfE) in conjunction with organisations representing the schools workforce, practitioners and others also committed to ensuring excellence in education. After completing the standards the government decided not to publish them and so a number of organisations interested in promoting the work of teaching assistants asked the DfE for permission to publish them. Permission was granted subject to it being made clear that the DfE was no longer involved in the production of the standards, which we are happy to do. These teaching assistant standards are non-mandatory and non-statutory, but they sit alongside the statutory standards for teachers and headteachers and help to define the role and purpose of teaching assistants to ensure that schools can maximise the educational value and contribution of employees working directly with pupils. As such, we believe that they provide a valuable tool for the whole school team. We aim for these standards to benefit you, your colleagues and your pupils. These standards are applicable to all teaching assistants in schools, working at all levels. It is hoped these standards will support and shape positive conversations teaching assistants have with colleagues, managers and headteachers around their own roles and professional development.